I need to build some speakers into a stone wall like the photo shown below. This will be a 70v system and I'd really like to have the tap available from the front so it can be adjusted once the speakers are installed. I'd normally use JBL Pro for this, but the taps are on the back. Anyone know of a suitable speaker with tap behind the front grill? I've never taken a JBL Control 25 apart, so I might also be able to just modify a pair? 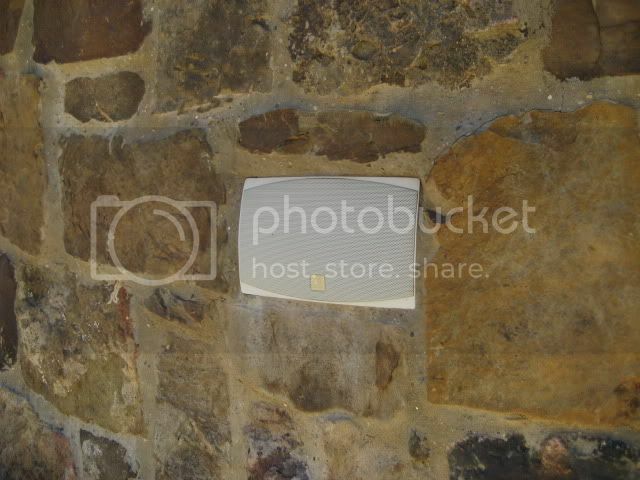 The application is one pair of speakers placed in the stone wall. Stone wall is above the end of a pool and will have a waterfall cascading over it into the pool. There will be a bench seat built into the pool allowing you to swim up and sit behind the waterfall. Client wants music while sitting behind the waterfall. Sound Advance makes a 70 volt weatherproof speaker called the fms660 that meets your requirements. My favorite supplier has a nice deal on them while supplies last. AKA Sonance, ive used the 660's on alot of jobs and they sound really good, especially for being 70v. Just curious, what happens when the chlorine that evaporates off the pool surface corrodes the speaker? how do you replace it if its mortared into the wall? maybe you can have the mason just do a thin coat around it that could be easilly chipped out when the day comes that it needs to be replaced. on the east coast we dont get to do all the fun stuff you west coaster's get to do like recessed speakers in the wall with stone surrounds :) i sometimes wished i lived out there to get to do all the fun outdoor stuff you guys get to. Could they rough in an enclosure (that is rust proof) that the speaker box could slide into, so when the speaker rots to hell in 5 years you could do an easy transplant? Last edited by Mr. Stanley on May 11, 2012 14:53. Could they rough in an enclure (that is rust proof) the the speaker enclosure could slide into, so when the speaker rots to hell in 5 years you could do an easy transplant? Hi Fred, thanks for the call and email with additional info. I'll be in touch next week after sorting out the particulars for the rest of the project. Just curious, what happens when the chlorine that evaporates off the pool surface corrodes the speaker? how do you replace it if its mortared into the wall? maybe you can have the mason just do a thin coat around it that could be easily chipped out when the day comes that it needs to be replaced. Spoke to the landscape designer this afternoon and things have already changed. Speakers won't be in the stone wall under the waterfall, but instead build into the side of some steps that come down on each side of the pool. Probably a better solution and gets the speakers a little more distance from the pool, but will still be set in stone. I've done this a few times and I think the oldest speakers are around 4-5 years old now without any issues. If the drivers or grill get rotted, it's easy enough to swap them out from the front and there's really not much to go bad with the plastic enclosures unless the speaker wire termination gets corroded and funky on the back. If needed, the speakers really wouldn't be that difficult to chisel out and replace. When I've done this before, the masons have built a wooden box the size of the speaker and kept that in place while building the wall. Once the wall was complete I brought out the speakers and they just filled in around them so they aren't really stuck in there that good. Thanks for sharing the picture... that's some really good faux work! And the transformer assembly and wiring for the Control 25 is built into the rear. It can't be moved.